Can’t format Micro SD card on your Android Phone or Windows PC? Are you not able to format Memory or Micro SD Card on our Android? Unable to format microSD card on your Windows PC? In this particular post you are going to learn few effective solutions that will help you to fix “Can’t format micro SD card” error on Android phone or Windows Computer without losing any data from the card. Let’s Start With User Practical Scenarios. I need help with my Sandsk 64gb sd card. I cannot format it or delete any of the files. I took the card out of my phone and put in a adapter, and deleted the files manually. They they somehow just pop back on there. When i rename files they change back when I go to access card again. When i try to format i get a error. Ivd tried 3 different SD programs and none of them work. Can somebody help me please. I have no problem accessing files or my phone reading card. Jus cant delete anything without it reappearing again. Samsung SD card unsupported in my mobile. So, those were just two example, however there are many people out there facing the similar kind of problem with their microSD card. 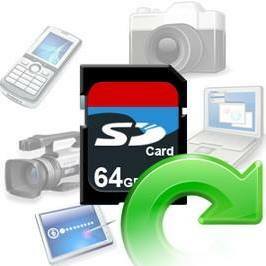 We all know that Micro SD card is used in different gadgets that are used to store huge amount of data. Some users uses micro SD card for saving and backing up data. But, longer you use the card, the more unwanted files accumulate on the card. Hence the best way to clear and free up space on the card is regularly format microSD card. However, as I mentioned above that there are several users encountering with the error message “can’t format microSD card” on Windows PC and Android phone and hence they cannot complete the format process. But what makes Micro SD card to display error “Cannot format Micro SD card”? Well, below find out common causes for the Micro SD card won’t format error. Generally, when a memory refuses to format, it means that card is running into some sort of problems. In major case, there is something wrong with the file system. For example, FAT32 card are used in some specific device, but if it is used in different devices, then file system turn raw and hence, Windows PC cannot recognize it. The memory card does not show up as a mass storage and so on. Though, it says that formatting the card will fix the problems, but ultimately the formatting fails. But why it happened so? We have discovered some simple causes that are responsible for the occurrence of micro SD card won’t format error. May be micro SD card is write-protected and therefore Windows is unable to format it. It might be possible that your card has bad sector and hence it becomes corrupted and won’t format. Using the card in multiple devices such as phones, computer, tablets can easily make your card get infected with virus. Making your Android device and Windows computer to hardly format the card to remove virus completely. May be your micro SD card got corrupted due to file system error and hence you get ‘can’t format Micro SD card’ error. Alright! Whatever may be the reasons behind the occurrence of ‘can’t format Micros SD card on Android’ or ‘can’t format Micro SD card Windows PC’, you can follow the below-mentioned solutions fix it. This is the first thing that you must check. If your micro SD card is locked then you must unlock it. Check if any lock switch is there or not. If there is any lock switch and it is locked then it means that your card is write-protected. So, how to remove write-protection from card? Simply slide switch to unlock position. That’s it. If you have locked your card with password, then simply remove the password from the card. 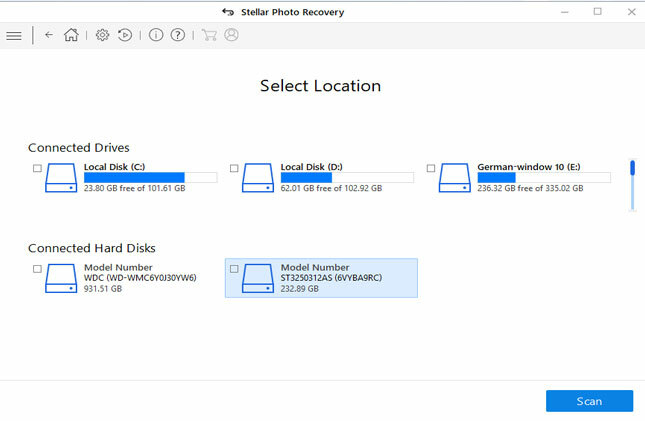 This solution is to extract/recover and backup data to computer from Micro SD card that throw “unable to format” error. 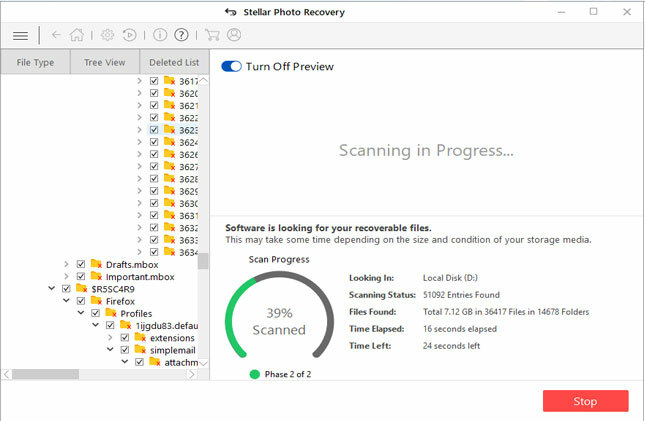 If your card has important or valuable data that you want back before formatting it then you must use professional and best Photo Recovery which is perfect Micro SD card data recovery software to retrieve media files such as photos, videos and audio files from can’t format microSD card. The best part about this software is that it is available for both Windows and Mac computer. You don’t have to worry about even if microSD card becomes inaccessible. 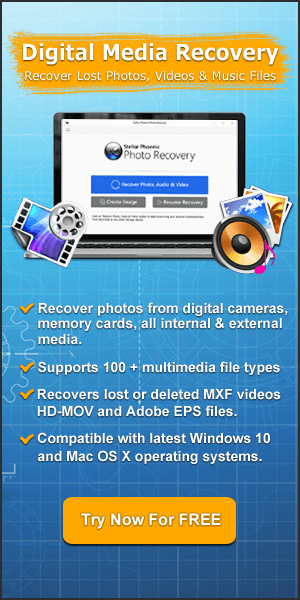 This best micro SD card file recovery software will completely restore all pictures, videos and audio file formats. 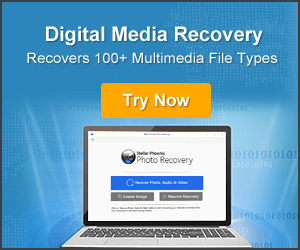 It doesn’t matter whether your card is write protected, locked, inaccessible, corrupted, virus infected or throw different error messages – it will help you to extract all media files with ease and in just few simple steps. After you successfully recover your valuable data from the micro SD memory card, you can then continue to fix ‘unable to format micro SD card’ error. Insert the microSD memory card to card reader and connect it to PC. On your PC click Start > -> All Programs -> Accessories -> Command Prompt. Now, you have to just wait for the process to get complete as Windows fixes all file system error and bad sectors. Note: Formatting Micro SD card will erase all data stored within it. Hence, it is advised that you must first recover important files from microSD card before formatting it. Connect your card to computer via card reader. On your PC click Start > My Computer > Right-Click on your Micro SD card and click on “Format” option. 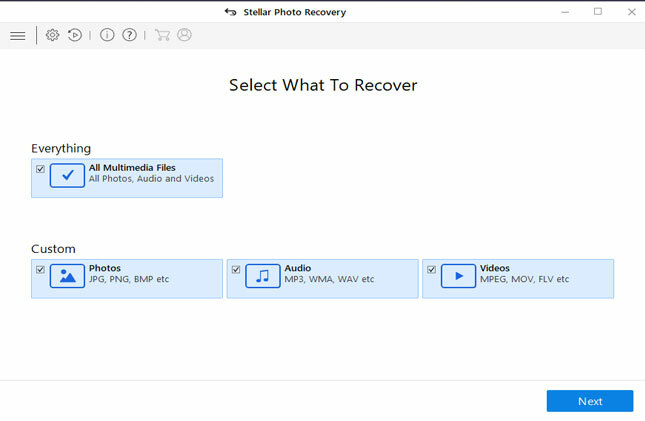 Additional Reading: How to Recover Lost Data From Unmounted SD Card? You have to take help of DISK Management to format Micro SD card on your computer. Connect your microSD card to your computer with the help of card reader. On your PC click Start > Control Panel > System and Security > Administrative Tools. Next click on Computer Management and then click on Disk Management. Here select the file system of your micro SD card into NTFS and then click OK to start format process. Once the process completes, you can then eject the card from your computer and then re-insert it back to any Android phone or other device to save data again. After this, you can unplug the SD card from your PC and insert it into your Android phone or other devices to save data again. 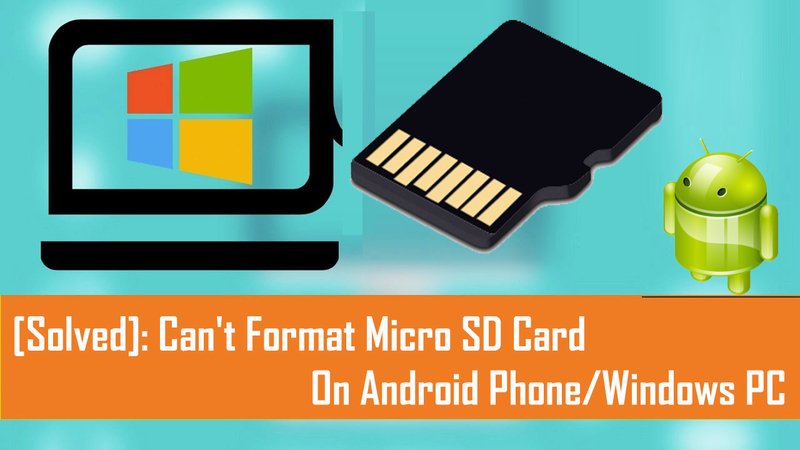 Though there are several causes for the occurrence of “can’t format micro SD card” error, but there are also several solutions that you have learned above to fix micro SD card won’t format on Windows PC and Android phone. 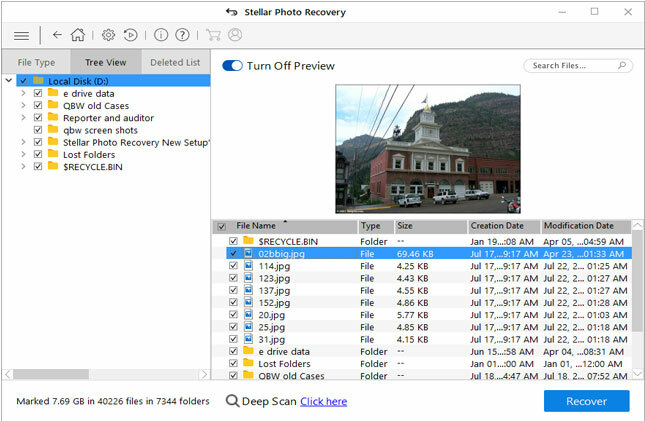 However, if you have valuable photos, videos or audio that you want to recover from your micro SD card before formatting it then you must use Photo Recovery software. [Solved]: Can't Format Micro SD Card on Android Phone/Windows PC. 1: Remove microSD Card Write Protection/Password. 4: Format MicroSD Card on Computer. 3: Repair File System Errors And Bad Sector.